Schematic of the lunar portion of earth's tides showing (exaggerated) high tides at the sublunar and antipodal points for the hypothetical case of an ocean of constant depth with no land. There would also be smaller, superimposed bulges on the sides facing toward and away from the sun. 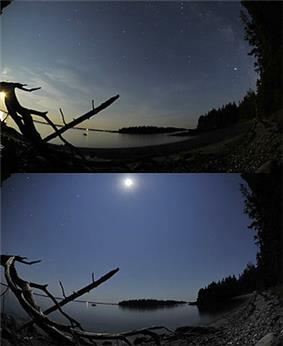 In Maine (U.S.) low tide occurs roughly at moonrise and high tide with a high moon, corresponding to the simple gravity model of two tidal bulges; at most places however, moon and tides have a phase shift. Some shorelines experience two almost equal high tides and two low tides each day, called a semi-diurnal tide. 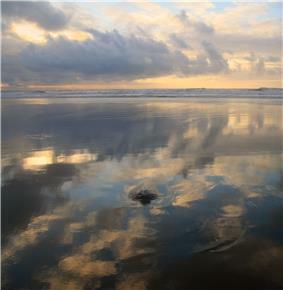 Some locations experience only one high and one low tide each day, called a diurnal tide. Some locations experience two uneven tides a day, or sometimes one high and one low each day; this is called a mixed tide. The times and amplitude of the tides at a locale are influenced by the alignment of the Sun and Moon, by the pattern of tides in the deep ocean, by the amphidromic systems of the oceans, and by the shape of the coastline and near-shore bathymetry (see Timing). Tides vary on timescales ranging from hours to years due to numerous influences. To make accurate records, tide gauges at fixed stations measure the water level over time. Gauges ignore variations caused by waves with periods shorter than minutes. These data are compared to the reference (or datum) level usually called mean sea level. Tidal phenomena are not limited to the oceans, but can occur in other systems whenever a gravitational field that varies in time and space is present. For example, the solid part of the Earth is affected by tides, though this is not as easily seen as the water tidal movements. Tidal changes are the net result of multiple influences that act over varying periods. These influences are called tidal constituents. The primary constituents are the Earth's rotation, the positions of the Moon and the Sun relative to Earth, the Moon's altitude (elevation) above the Earth's equator, and bathymetry. Variations with periods of less than half a day are called harmonic constituents. Conversely, cycles of days, months, or years are referred to as long period constituents. The tidal forces affect the entire earth, but the movement of the solid Earth is only centimeters. The atmosphere is much more fluid and compressible so its surface moves kilometers, in the sense of the contour level of a particular low pressure in the outer atmosphere. The semi-diurnal range (the difference in height between high and low waters over about half a day) varies in a two-week cycle. Approximately twice a month, around new moon and full moon when the Sun, Moon, and Earth form a line (a condition known as syzygy), the tidal force due to the sun reinforces that due to the Moon. The tide's range is then at its maximum; this is called the spring tide. It is not named after the season, but, like that word, derives from the meaning "jump, burst forth, rise", as in a natural spring. The changing distance separating the Moon and Earth also affects tide heights. When the Moon is closest, at perigee, the range increases, and when it is at apogee, the range shrinks. Every 7½ lunations (the full cycles from full moon to new to full), perigee coincides with either a new or full moon causing perigean spring tides with the largest tidal range. Even at its most powerful this force is still weak causing tidal differences of inches at most. The shape of the shoreline and the ocean floor changes the way that tides propagate, so there is no simple, general rule that predicts the time of high water from the Moon's position in the sky. Coastal characteristics such as underwater bathymetry and coastline shape mean that individual location characteristics affect tide forecasting; actual high water time and height may differ from model predictions due to the coastal morphology's effects on tidal flow. However, for a given location the relationship between lunar altitude and the time of high or low tide (the lunitidal interval) is relatively constant and predictable, as is the time of high or low tide relative to other points on the same coast. For example, the high tide at Norfolk, Virginia, predictably occurs approximately two and a half hours before the Moon passes directly overhead. For an ocean in the shape of a circular basin enclosed by a coastline, the cotidal lines point radially inward and must eventually meet at a common point, the amphidromic point. The amphidromic point is at once cotidal with high and low waters, which is satisfied by zero tidal motion. (The rare exception occurs when the tide encircles an island, as it does around New Zealand, Iceland and Madagascar.) Tidal motion generally lessens moving away from continental coasts, so that crossing the cotidal lines are contours of constant amplitude (half the distance between high and low water) which decrease to zero at the amphidromic point. For a semi-diurnal tide the amphidromic point can be thought of roughly like the center of a clock face, with the hour hand pointing in the direction of the high water cotidal line, which is directly opposite the low water cotidal line. High water rotates about the amphidromic point once every 12 hours in the direction of rising cotidal lines, and away from ebbing cotidal lines. This rotation is generally clockwise in the southern hemisphere and counterclockwise in the northern hemisphere, and is caused by the Coriolis effect. The difference of cotidal phase from the phase of a reference tide is the epoch. The reference tide is the hypothetical constituent "equilibrium tide" on a landless Earth measured at 0° longitude, the Greenwich meridian. Investigation into tidal physics was important in the early development of heliocentrism and celestial mechanics, with the existence of two daily tides being explained by the Moon's gravity. 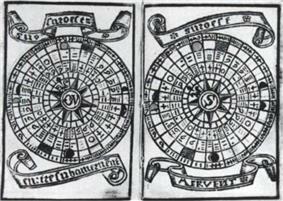 Later the daily tides were explained more precisely by the interaction of the Moon's and the sun's gravity. Seleucus of Seleucia theorized around 150 B.C. that tides were caused by the Moon. In 1609 Johannes Kepler also correctly suggested that the gravitation of the Moon caused the tides, which he based upon ancient observations and correlations. It was originally mentioned in Ptolemy's Tetrabiblos as having derived from ancient observation. Galileo Galilei in his 1632 Dialogue Concerning the Two Chief World Systems, whose working title was Dialogue on the Tides, gave an explanation of the tides. The resulting theory, however, was incorrect as he attributed the tides to the sloshing of water caused by the Earth's movement around the sun. He hoped to provide mechanical proof of the Earth's movement – the value of his tidal theory is disputed. Galileo rejected Kepler's explanation of the tides. The tidal force produced by a massive object (Moon, hereafter) on a small particle located on or in an extensive body (Earth, hereafter) is the vector difference between the gravitational force exerted by the Moon on the particle, and the gravitational force that would be exerted on the particle if it were located at the Earth's center of mass. The solar gravitational force on the Earth is on average 179 times stronger than the lunar, but because the Sun is on average 389 times farther from the Earth, its field gradient is weaker. The solar tidal force is 46% as large as the lunar. More precisely, the lunar tidal acceleration (along the Moon–Earth axis, at the Earth's surface) is about 1.1 × 10−7 g, while the solar tidal acceleration (along the Sun–Earth axis, at the Earth's surface) is about 0.52 × 10−7 g, where g is the gravitational acceleration at the Earth's surface. Venus has the largest effect of the other planets, at 0.000113 times the solar effect. The ocean's surface is closely approximated by an equipotential surface, (ignoring ocean currents) commonly referred to as the geoid. Since the gravitational force is equal to the potential's gradient, there are no tangential forces on such a surface, and the ocean surface is thus in gravitational equilibrium. Now consider the effect of massive external bodies such as the Moon and Sun. These bodies have strong gravitational fields that diminish with distance in space and which act to alter the shape of an equipotential surface on the Earth. This deformation has a fixed spatial orientation relative to the influencing body. The Earth's rotation relative to this shape causes the daily tidal cycle. Gravitational forces follow an inverse-square law (force is inversely proportional to the square of the distance), but tidal forces are inversely proportional to the cube of the distance. The ocean surface moves because of the changing tidal equipotential, rising when the tidal potential is high, which occurs on the parts of the Earth nearest to and furthest from the Moon. When the tidal equipotential changes, the ocean surface is no longer aligned with it, so the apparent direction of the vertical shifts. The surface then experiences a down slope, in the direction that the equipotential has risen. The ocean bathymetry greatly influences the tide's exact time and height at a particular coastal point. 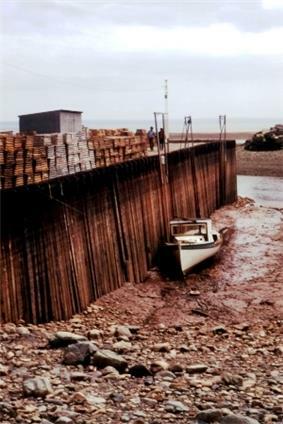 There are some extreme cases; the Bay of Fundy, on the east coast of Canada, is often stated to have the world's highest tides because of its shape, bathymetry, and its distance from the continental shelf edge. Measurements made in November 1998 at Burntcoat Head in the Bay of Fundy recorded a maximum range of 16.3 metres (53 ft) and a highest predicted extreme of 17 metres (56 ft). Similar measurements made in March 2002 at Leaf Basin, Ungava Bay in northern Quebec gave similar values (allowing for measurement errors), a maximum range of 16.2 metres (53 ft) and a highest predicted extreme of 16.8 metres (55 ft). Ungava Bay and the Bay of Fundy lie similar distances from the continental shelf edge, but Ungava Bay is free of pack ice for only about four months every year while the Bay of Fundy rarely freezes. Southampton in the United Kingdom has a double high water caused by the interaction between the region's different tidal harmonics, caused primarily by the east/west orientation of the English Channel and the fact that when it is high water at Dover it is low water at Land's End (some 300 nautical miles distant) and vice versa. This is contrary to the popular belief that the flow of water around the Isle of Wight creates two high waters. The Isle of Wight is important, however, since it is responsible for the 'Young Flood Stand', which describes the pause of the incoming tide about three hours after low water. it is clear that a compound term involving the product of two cosine terms each with their own frequency is the same as three simple cosine terms that are to be added at the original frequency and also at frequencies which are the sum and difference of the two frequencies of the product term. (Three, not two terms, since the whole expression is (1 + \cos x)\cos y.) Consider further that the tidal force on a location depends also on whether the moon (or the sun) is above or below the plane of the equator, and that these attributes have their own periods also incommensurable with a day and a month, and it is clear that many combinations result. With a careful choice of the basic astronomical frequencies, the Doodson Number annotates the particular additions and differences to form the frequency of each simple cosine term. Tides at Bridgeport, Connecticut, U.S.A. during a 50 hour period. Tides at Bridgeport, Connecticut, U.S.A. during a 30 day period. 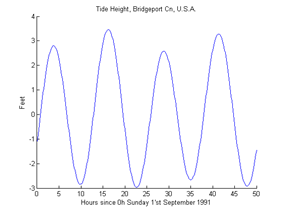 Tides at Bridgeport, Connecticut, U.S.A. during a 400 day period. Chart illustrating that tidal heights enter in calculations of legally significant data such as boundary lines between the high seas and territorial waters. Chart shows an exemplar coastline, identifying bottom features such as longshore bar and berms, tidal heights such as mean higher high water, and distances from shore such as the 12 mile limit. Intertidal ecology is the study of different species. The most important interactions may vary according to the type of intertidal community. 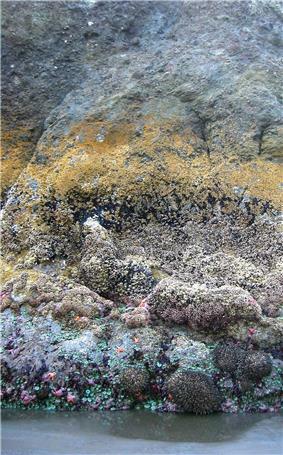 The broadest classifications are based on substrates — rocky shore or soft bottom. Shallow areas in otherwise open water can experience rotary tidal currents, flowing in directions that continually change and thus the flow direction (not the flow) completes a full rotation in 12½ hours (for example, the Nantucket Shoals). Large lakes such as Superior and Erie can experience tides of 1 to 4 cm, but these can be masked by meteorologically induced phenomena such as seiche. The tide in Lake Michigan is described as 0.5 to 1.5 inches (13 to 38 mm) or 1¾ inches. Earth tides or terrestrial tides affect the entire Earth's mass, which acts similarly to a liquid gyroscope with a very thin crust. The Earth's crust shifts (in/out, east/west, north/south) in response to lunar and solar gravitation, ocean tides, and atmospheric loading. While negligible for most human activities, terrestrial tides' semi-diurnal amplitude can reach about 55 centimetres (22 in) at the equator—15 centimetres (5.9 in) due to the sun—which is important in GPS calibration and VLBI measurements. Precise astronomical angular measurements require knowledge of the Earth's rotation rate and nutation, both of which are influenced by Earth tides. The semi-diurnal M2 Earth tides are nearly in phase with the moon with a lag of about two hours. Some particle physics experiments must adjust for terrestrial tides. For instance, at CERN and SLAC, the very large particle accelerators account for terrestrial tides. Among the relevant effects are circumference deformation for circular accelerators and particle beam energy. Since tidal forces generate currents in conducting fluids in the Earth's interior, they in turn affect the Earth's magnetic field. Earth tides have also been linked to the triggering of earthquakes. See also earthquake prediction. Tsunamis, the large waves that occur after earthquakes, are sometimes called tidal waves, but this name is given by their resemblance to the tide, rather than any actual link to the tide. Other phenomena unrelated to tides but using the word tide are rip tide, storm tide, hurricane tide, and black or red tides. ^ Reddy, M.P.M. & Affholder, M. (2002). Descriptive physical oceanography: State of the Art. Taylor and Francis. p. 249. ^ Hubbard, Richard (1893). Boater's Bowditch: The Small Craft American Practical Navigator. McGraw-Hill Professional. p. 54. ^ Coastal orientation and geometry affects the phase, direction, and amplitude of amphidromic systems, coastal Kelvin waves as well as resonant seiches in bays. In estuaries seasonal river outflows influence tidal flow. ^ "Tidal lunar day". Do not confuse with the astronomical lunar day on the Moon. A lunar zenith is the Moon's highest point in the sky. ^ Mellor, George L. (1996). Introduction to physical oceanography. Springer. p. 169. 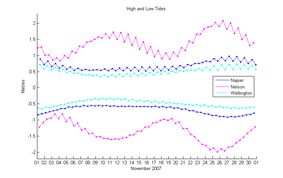 ^ Tide tables usually list mean lower low water (mllw, the 19 year average of mean lower low waters), mean higher low water (mhlw), mean lower high water (mlhw), mean higher high water (mhhw), as well as perigean tides. These are mean values in the sense that they derive from mean data. "Glossary of Coastal Terminology: H–M". Washington Department of Ecology, State of Washington. Retrieved 5 April 2007. ^ "Types and causes of tidal cycles". U.S. National Oceanic and Atmospheric Administration (NOAA) National Ocean Service (Education section). ^ Swerdlow, Noel M.; Neugebauer, Otto (1984). 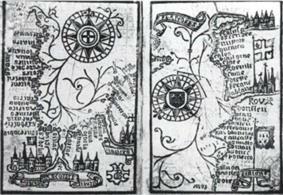 Mathematical astronomy in Copernicus's De revolutionibus, Volume 1. Springer-Verlag. p. 76. ^ Plait, Phil (11 March 2011). "No, the "supermoon" didn't cause the Japanese earthquake". Discover Magazine. Retrieved 16 May 2012. ^ Rice, Tony (4 May 2012). "Super moon looms Saturday". WRAL-TV. Retrieved 5 May 2012. ^ U.S. National Oceanic and Atmospheric Administration (NOAA) National Ocean Service (Education section), map showing world distribution of tide patterns, semi-diurnal, diurnal and mixed semi-diurnal. ^ Ross, D.A. (1995). Introduction to Oceanography. New York, NY: HarperCollins. pp. 236–242. ^ Accad, Y. & Pekeris, C.L. (November 28, 1978). "Solution of the Tidal Equations for the M2 and S2 Tides in the World Oceans from a Knowledge of the Tidal Potential Alone". Philosophical Transactions of the Royal Society of London. Series A, Mathematical and Physical Sciences 290 (1368): 235–266. ^ "Tide forecasts". New Zealand: National Institute of Water & Atmospheric Research. Retrieved 2008-11-07. Including animations of the M2, S2 and K1 tides for New Zealand. ^ Schureman, Paul (1971). Manual of harmonic analysis and prediction of tides. U.S. Coast and geodetic survey. p. 204. ^ Ptolemy with Frank E. Robbins, trans., Tetrabiblos (Cambridge, Massachusetts: Harvard University Press, 1940), Book 1, chapter 2. From chapter 2: "The moon, too, as the heavenly body nearest the earth, bestows her effluence most abundantly upon mundane things, for most of them, animate or inanimate, are sympathetic to her and change in company with her; the rivers increase and diminish their streams with her light, the seas turn their own tides with her rising and setting, … "
^ a b Lisitzin, E. (1974). 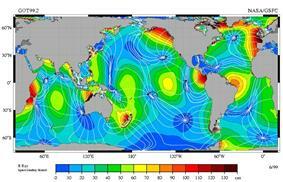 "2 "Periodical sea-level changes: Astronomical tides"". Sea-Level Changes, (Elsevier Oceanography Series) 8. p. 5. ^ "What Causes Tides?". U.S. National Oceanic and Atmospheric Administration (NOAA) National Ocean Service (Education section). ^ See for example, in the 'Principia' (Book 1) (1729 translation), Corollaries 19 and 20 to Proposition 66, on pages 251–254, referring back to page 234 et seq. ; and in Book 3 Propositions 24, 36 and 37, starting on page 255. ^ Wahr, J. (1995). Earth Tides in "Global Earth Physics", American Geophysical Union Reference Shelf #1,. pp. 40–46. ^ a b Zuosheng, Y.; Emery, K.O. & Yui, X. (July 1989). "Historical Development and Use of Thousand-Year-Old Tide-Prediction Tables". Limnology and Oceanography 34 (5): 953–957. ^ Cartwright, David E. (1999). Tides: A Scientific History. Cambridge, UK: Cambridge University Press. ^ Case, James (March 2000). "Understanding Tides—From Ancient Beliefs to Present-day Solutions to the Laplace Equations". SIAM News 33 (2). ^ Doodson, A.T. (December 1921). "The Harmonic Development of the Tide-Generating Potential". Proceedings of the Royal Society of London. Series A 100 (704): 305–329. ^ Casotto, S. & Biscani, F. (April 2004). "A fully analytical approach to the harmonic development of the tide-generating potential accounting for precession, nutation, and perturbations due to figure and planetary terms". AAS Division on Dynamical Astronomy 36 (2): 67. ^ Moyer, T.D. (2003) "Formulation for observed and computed values of Deep Space Network data types for navigation", vol. 3 in Deep-space communications and navigation series, Wiley, pp. 126–8, ISBN 0-471-44535-5. ^ According to NASA the lunar tidal force is 2.21 times larger than the solar. ^ See Tidal force – Mathematical treatment and sources cited there. ^ Munk, W.; Wunsch, C. (1998). "Abyssal recipes II: energetics of tidal and wind mixing". Deep Sea Research Part I Oceanographic Research Papers 45 (12): 1977. ^ Ray, R.D. ; Eanes, R.J.; Chao, B.F. (1996). "Detection of tidal dissipation in the solid Earth by satellite tracking and altimetry". Nature 381 (6583): 595. ^ The day is currently lengthening at a rate of about 0.002 seconds per century. Lecture 2: The Role of Tidal Dissipation and the Laplace Tidal Equations by Myrl Hendershott. GFD Proceedings Volume, 2004, WHOI Notes by Yaron Toledo and Marshall Ward. ^ Flussi e riflussi. Milano: Feltrinelli. 2003. 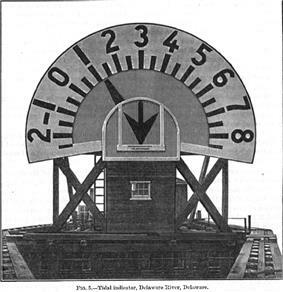 ^ "The Doodson–Légé Tide Predicting Machine". Proudman Oceanographic Laboratory. Retrieved 2008-10-03. ^ Webster, Thomas (1837). The elements of physics. Printed for Scott, Webster, and Geary. p. 168. ^ "FAQ". Retrieved June 23, 2007. ^ a b O'Reilly, C.T.R. ; Ron Solvason and Christian Solomon (2005). Ryan, J., ed. "Where are the World's Largest Tides". BIO Annual Report "2004 in Review" (Washington, D.C.: Biotechnol. Ind. Org. ): 44–46. ^ a b Charles T. O'reilly, Ron Solvason, and Christian Solomon. "Resolving the World's largest tides", in J.A Percy, A.J. Evans, P.G. Wells, and S.J. 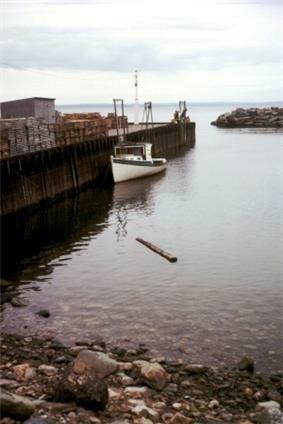 Rolston (Editors) 2005: The Changing Bay of Fundy-Beyond 400 years, Proceedings of the 6th Bay of Fundy Workshop, Cornwallis, Nova Scotia, Sept. 29, 2004 to October 2, 2004. Environment Canada-Atlantic Region, Occasional Report no. 23. Dartmouth, N.S. and Sackville, N.B. ^ "English Channel double tides". Bristolnomads.org.uk. Retrieved 2012-08-28. ^ To demonstrate this Tides Home Page offers a tidal height pattern converted into an .mp3 sound file, and the rich sound is quite different from a pure tone. ^ Society for Nautical Research (1958). The Mariner's Mirror. Retrieved 2009-04-28. ^ Bos, A.R. ; Gumanao, G.S. ; van Katwijk, M.M. ; Mueller, B.; Saceda, M.M. & Tejada, R.P. (2011). "Ontogenetic habitat shift, population growth, and burrowing behavior of the Indo-Pacific beach star Archaster typicus (Echinodermata: Asteroidea)". Marine Biology 158 (3): 639–648. ^ Bos, A.R. & Gumanao, G.S. (2012). "The lunar cycle determines availability of coral reef fishes on fish markets". Journal of Fish Biology 81 (6): 2074–2079. ^ Le Lacheur, Embert A. Tidal currents in the open sea: Subsurface tidal currents at Nantucket Shoals Light Vessel Geographical Review, April 1924. Accessed: 4 February 2012. ^ "Do the Great Lakes have tides?". Great Lakes Information Network. October 1, 2000. Retrieved 2010-02-10. ^ Calder, Vince. "Tides on Lake Michigan". Argonne National Laboratory. Retrieved 2010-02-10. ^ Dunkerson, Duane. "moon and Tides". Astronomy Briefly. Retrieved 2010-02-10. ^ Takao, M. & Shimida, T. (2000). "Long term variation of the circumference of the spring-8 storage ring". Proceedings of EPAC (Vienna, Austria). ^ Tanaka, Sachiko (2010). "Tidal triggering of earthquakes precursory to the recent Sumatra megathrust earthquakes of 26 December 2004 (Mw9.0), 28 March 2005 (Mw8.6), and 12 September 2007 (Mw8.5)". Geophys. Res. Lett. 37 (2): L02301. ^ Nurmi, P., Valtonen, M.J. & Zheng, J.Q. (2001). "Periodic variation of Oort Cloud flux and cometary impacts on the Earth and Jupiter".